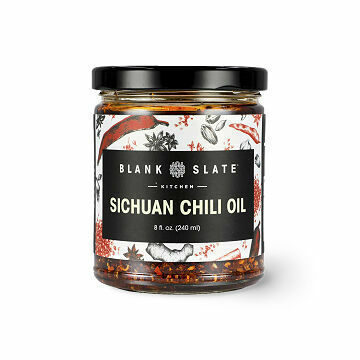 Alex Sorenson’s insanely crave-y chili oil is the condiment of Szechuan flavor-seekers’ dreams. Do you favor Asian flavor? Wait 'til you taste New York Times-starred chef Alex Sorenson's infused wow in a jar. He makes it in small batches from eleven Chinese spices poured over toasted chilis and Szechuan peppercorns (the famously tongue-numbing kind). Tantalizingly tingly and complexly layered, it's hot, but not overwhelming. Drizzle onto the protein, veggie, noodle, and dumpling dishes you love to add a sophisticated kick you'll soon learn to crave. Vegan; GMO-, gluten-, and preservative-free. Handmade in Brooklyn. Alex Sorenson started his food career as a part-time prep cook to pay for school at the University of Virginia. A software developer for a number of years, his passion for cooking gradually pushed coding aside. So he scrapped his recently-founded company, took an internship in a kitchen, and worked his way from restaurant to restaurant, until he earned the title Executive Chef. After cooking in some of New York City’s top kitchens, Alex took a break to work on small organic farms and vineyards in France. He picked grapes in Bordeaux, herded goats, made cheese, foraged for wild mushrooms, and cooked in farmhouse kitchens. Upon his return to New York, his deeper knowledge of local, sustainable ingredients made him determined to produce top-quality ingredients for home cooks and mixologists. Having lived and worked in France, Rwanda, and Borneo, Alex frequently travels to the far corners of the Earth in search of exciting new flavors, techniques,and dishes.